Play free solitaire card games including spider solitaire, klondike solitaire, freecell solitaire and more classic solitaire games. Solitaire (also known as Patience) is one of the most popular single-player card games in the world. New games added: Scorpion Solitaire, Tripeaks Solitaire, Russian Solitaire, Yukon-Solitaire. Solitaire (also called patience) is a mind game, it is considered by many to be the most recognized card game created. It is also believed that playing Solitaire is a good exercise for the mind and a lot of people are making it a daily habit to play at least one game of solitaire a day. Thanks to the Internet everyone can now easily play Solitaire from any computer (PC or Mac) and even tablets and cellular phones, no installation is required. There are many variations of Solitaire, most of them you can play online on this website by clicking on the icons and links above. We also provide a few tutorials where you can learn how to play Solitaire and about Solitaire rules. You can read below for more information and also visit Wikipedia. 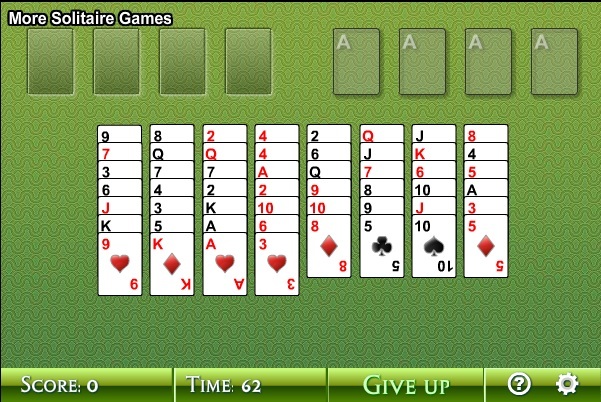 We currently have 16 variations of solitaire you can play online. The most popular ones are FreeCell Solitaire, Spider Solitaire and Klondike Solitaire but you should definitely try the other solitaire games as well. You can save your high-scores as you play along, making it a more competitive experience if you choose it to be. One of the least known versions of solitaire is Pyramid solitaire which is one of my favorites that's why I'm mentioning it here. In pyramid solitaire, you have to get all the cards from the pyramid to the foundation. Pairs of cards are removed only if their total value is 13. We also recommed checking out Sudoku if you haven't tried it already, it's one of the most popular and challenging numberic puzzles and we have a great sudoku website where you can time your solving effort and compete against other players from all over the world. If you see any more versions of solitaire online we'd be happy if you told us using the contact us form so we can add it to the website. We hope you have fun and exercise your brain-cells playing our solitaires. Copyright © 2009-2019 digsolitaire.com All rights reserved.